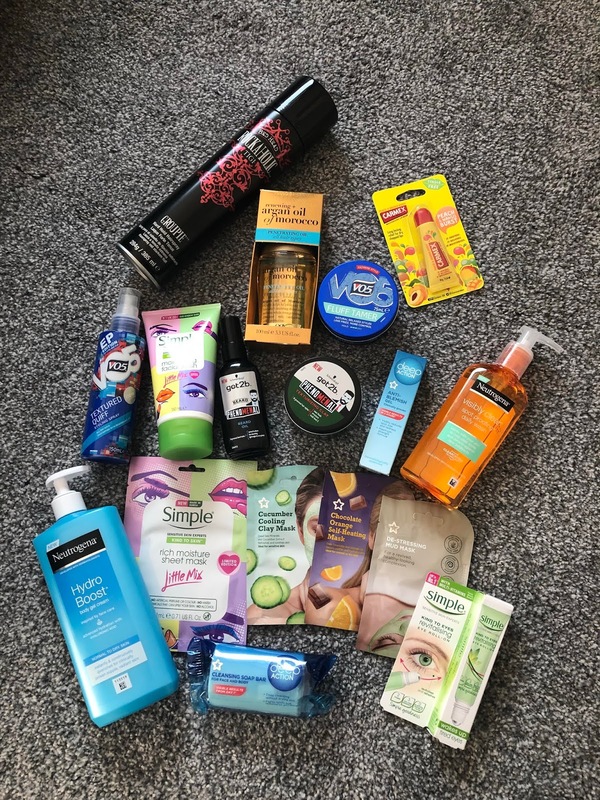 I don't tend to go into Superdrug very often mainly because some of my favourite items are cheaper in Boots. However, on a recent visit to the White Rose I popped in to pick up some face masks, half hour I came out with a bag full of items and my bank account £41.00 lighter. I have been having bad breakouts lately and really want to start taking care of my skin more so here is what I picked up. So fist up is what I actually went in for the face masks. I picked up 3 of Superdrug's own face masks as they were on 3 for 2. I have never used these before so I am quite looking forward to trying them out. 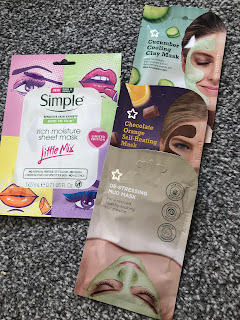 I also picked up my first ever sheet mask, I have to admit that I only got this due to it being a collab with Little Mix but I have heard good things about these masks. Then I went to the rest of the skincare aisle and spent way more than I should have especially on things for my face. 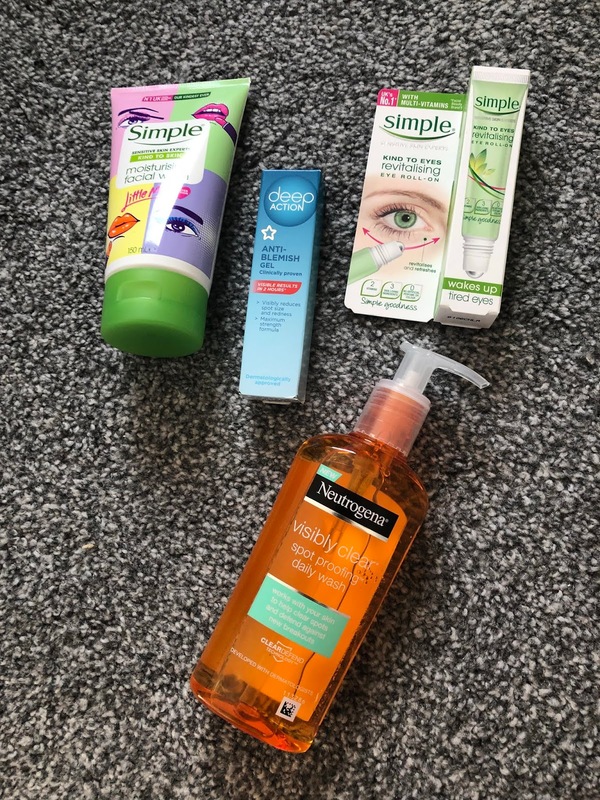 I wanted to change up my face wash to see if that helped with my breakouts so I got the visibly clear daily wash to give a try, I used to love this range so I can't wait to give this one a go again. 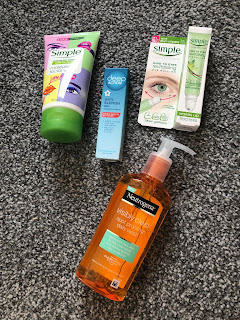 I also picked up the Simple face wash, again this is just because it was a Little Mix one but my mum always Simple is a really good brand for skincare. I also picked up an anti blemish gel just to give a try because as I say my skin is absolutely awful, it is actually one reason I haven't posted any pictures of myself recently. I also got a Simple eye roll on, the main reason for this is to make me look a little more alive. I unfortunately inherited my dad's dark circle under his eyes and I will do anything to reduce these. After wandering around a bit I found the cleansing soap bar, something that was reduced that I just picked to test out. If it helps calm the tops of my arms down which are covered in little spots I will be very happy. Although it is a face and body one I think I will just be using this on my body. My lips are another thing I don't take care of but I really should, so I picked up the Carmex peach and mango. I am hoping this fixes them up a little and if it is good I may get a few more to keep in my bag and drawer at work. 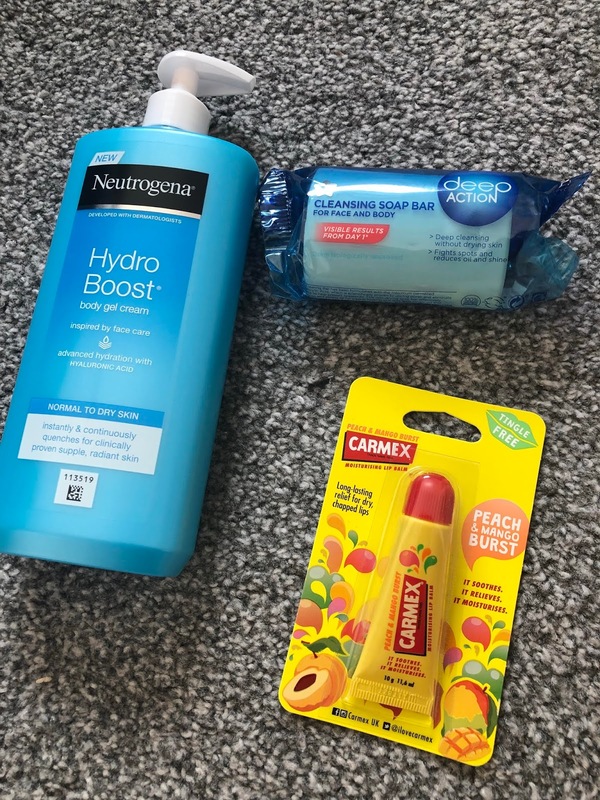 The Hydro Boost body gel cream is something I have been curious about so when I saw it was on offer I picked up a bottle for myself. I never moisturise my body and I really should so hopefully this will help me get into a bit of a routine. Obviously I wasn't going into the shop and not coming out without anything hair related. I picked up my trusty fluff tamer. I have lost track of how many tins of this I have gone through I love the stuff. 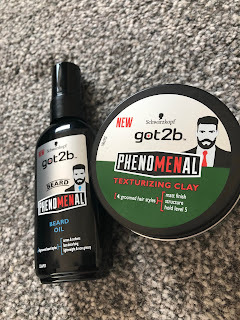 It was 2 for £6 on V05 so i also picked up this new textured quiff spray ready for when I get my hair done again, I am sure I will do a tried and tested post on this one day. 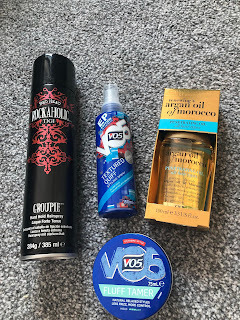 I have watched a lot of hair videos on YouTube recently and they all involve using an oil on the hair as a repair product or pre-styler so I thought I would pick up a bottle to see if it helped my hair. Finally I got the biggest can of hairspray they had in stock. I can go through 2 cans a month so I hoping I can make this last, this is the TIGI Rockaholic one which I have not used before so I am hoping it does its job. 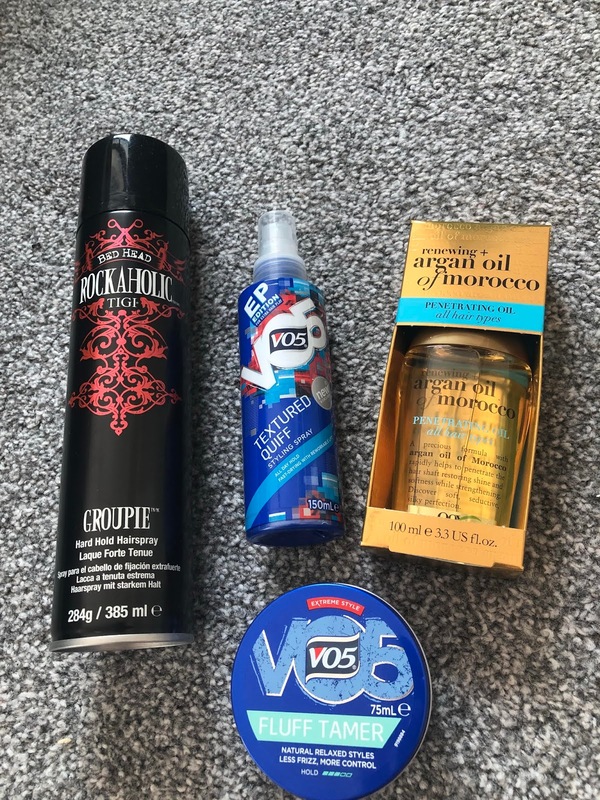 Finally I treated Liam to a couple of items, he loves his beard when it is long I try convincing him to cut it but it isn't happening so I got him the beard oil to see if it can tame it and make it a little softer. I also picked up this texturizing clay for him as he recently had his hair cut a lot shorter than usual and I didn't fancy him stealing my products. I am hoping this all keeps the bathroom stocked for a while and that it helps me get my skin under control again. If you want to see a post on any of the items, let me know.